If you need me, I’ll be doing some research. Oh sure, let me just break out my smartphone and dial up Matt Cutts for a quick bit of insight. Be right back. Annnnnnnd since that will never happen this side of TMZ stalking … well, me, it’s time to get strategic with your research. However, understand all that time online needs to be spent searching for one thing — keywords. Why? That’s how that brand will be found in the first place. 2. Location. Location. Location. In real estate, that is the golden rule; however, it is not such a bad rule of thumb with search engines as well. If your desired brand is not coming up in search as you would like, consider geo-targeting some words. Let’s say you want to find a particular dining establishment. If you just enter <BRAND> <TYPE OF FOOD>, you will be on Google all day long, lose your appetite, and end up scarfing down that three-week-old Hot Pocket in your freezer. Add <CITY> and your search could end after page one. That’s not cheating your client; that’s a clue for you to enhance location as a keyword because the competition forces your hand that way. 3. Fish for Long Tails. 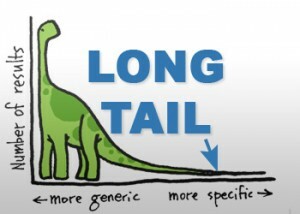 Ever heard of “long tail keywords”? Odds are you haven’t but you use them daily. Think more “key phrases” of about three to five words (sans stop words on occasion) and you are angling in the long-tail pond. If you are a java fan, you have searched “coffee” or “coffee beans”. That’s general search, which is a great portion of the traffic. However, did you know most of the actual conversion happens when you search for “medium roast coffee beans” or “medium roast vacuum pack coffee beans”? And there is a long-tail keyword. Sometimes, specificity helps because one- to two-word search terms are owned (or spammed) by the bigger brands anyway. 4. 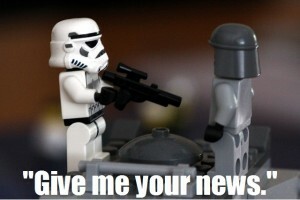 Newsjacking. This is an inside term that you may know better as “trends”. If there is a trend out there gaining popularity and not going anywhere, such as “the new economy,” think about the brand you represent. Can your client capitalize on that trend and speak to prospective consumers who search for that trend? They are looking for news, and then (thanks to some inventive keyword optimization), those people find your brand. And you just hijacked their interest — “news-jacking.” Here’s a very good example: Remember Pharrell’s 10-gallon-monstrosity of a hat? See? You already know what’s next: Arby’s wanting its hat back! A viral sensation later and they had busy drive-thrus. 5. Be Competitive. 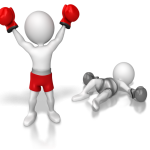 If your brand is always getting beat by the other guys, find out what the other guys are doing. Search them. Odds are they have a keyword your brand could use but have been overlooking for years. Think about the aforementioned tips, now search your competition. You want to keep with the joneses? Sometimes, you need to be the Joneses to understand what is working. How specific are they? How geo-centric are they? What is their special sauce? It’s not stealing, so your ethics can rest. I’ve always said, “There is no such thing as an original idea … only different ideas.” Get some inspiration from them and make a different tool for you.